Refills Lexington Gray (Bulletproof) Bottled Ink. 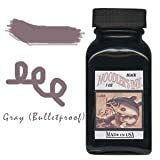 Noodler's Ink Gray Bulletproof has been formulated with Bullet Proof qualities so that it is impervious to water bleach and light. It is as fraud-proof as Noodler's Bullet Proof Black. Noodler's Ink is for doctors lawyers engineers business people anyone who needs their work to be absolutely permanent fraud proof and still copyable.3 ounces of ink per bottle. Noodler's Ink is 100% made in the USA from cap to glass to ink. Archival quality inks in large 3oz. bottles for vintage or new fountain pens. 100-percent made in the USAArchival quality inkeFor use in vintage or new fountain pens. NEW! 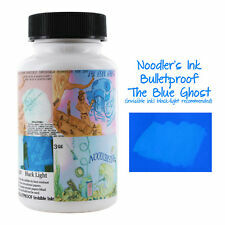 Noodler's Permanent Blue Ghost Invisible Ink. Safe for use in all Fountain Pens... When you want to write something no one else should see -- under normal light it's invisible, under a black light visible... New 3 oz. bottle... This ink is new, current product directly from the manufacturer. The bottle is glass with a distinctive Noodler's label, and an outside Noodler's box. Ink is all U.S. made and boasts Archival, Anti-Forgery and Anti- Feathering features. The ink is specifically designed for fountain pen use. 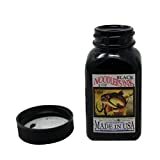 The Noodler’s Ink Nightshade Ink Bottle Refill. Ink bottle in nightshade color are the virtuoso choice for those who want to experience its impression on their writing. Noodler's Ink is 100% made in the USA. Archival quality inks in large 3oz. bottles for vintage or new fountain pens. Compare the color to that of a pencil line. This is not a watered down black, but a nicely saturated gray. Bulletproof, Eternal, Forgery- and Water-resistant. Noodler's Ink is 100% made in the USA from cap to glass to ink. Archival quality inks in large 3oz. bottles for vintage or new fountain pens. Compare the color to that of a pencil line. This is not a watered down black, but a nicely saturated gray. Bulletproof, Eternal, Forgery- and Water-resistant.